Myron Stephens is an artist who appreciates life and the gifts that he has been given. His work reveals this appreciation as an extension of himself, an unfolding of his experiences, and an opportunity to share his enjoyment of life with the viewer. His iconography, along with a distinct play on words, presents a sense of individualism, creating a style that is distinctly his own. Adult themes against everyday backdrops include messages scribbled in double entendre that contrast mature subject matter with playful elements. The result is an ability to share his personal mythology and create a new world with every layer placed on the canvas. 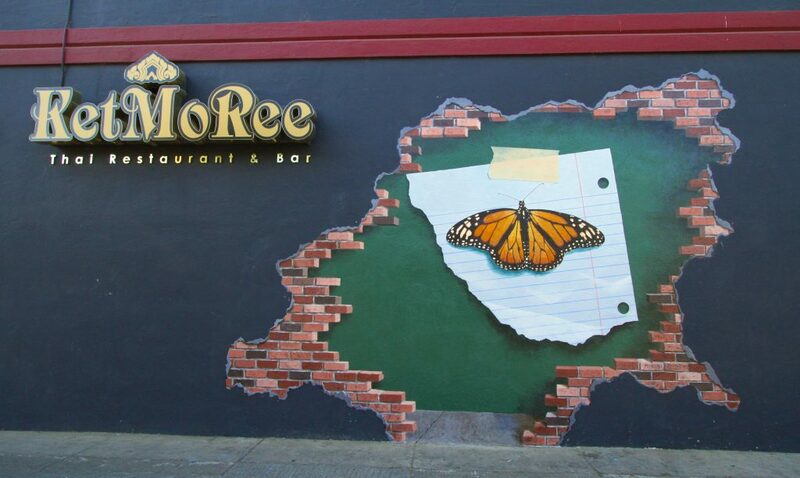 Stephens is known for his trompe l’oeil “trick-the-eye” super-realism, as represented by the oil and acrylic illusion of a realistic butterfly, tape, and paper on a chalkboard in “Perfect” (2012). Stephens’ paintings have sparked debates between those who maintain that the paper, tape, and chalk writing was real and those who knew it wasn’t. However, his unique style has evolved over the years. Stephens’ work ranges from baroque, to surreal, to most recently, urban and rural landscapes with vintage signs painted over graffiti backgrounds, and super-real trompe l’oeil chalkboards.